Avoiding the perilous past of its forerunner, the U.S. Air Force's newly launched anti-jam communications satellite has successfully fired its main engine three times to maneuver toward the intended operational orbit. The Advanced Extremely High Frequency 2 spacecraft, AEHF 2, was launched atop an Atlas 5 rocket from Cape Canaveral on May 4, reaching a supersynchronous transfer orbit stretching from 138 statute miles at its lowest point to over 31,200 statute miles at its highest and inclined 20.6 degrees to the equator. Launch vehicles typically deploy payloads into preliminary orbits, then allow the satellites to boost themselves to the final destinations. 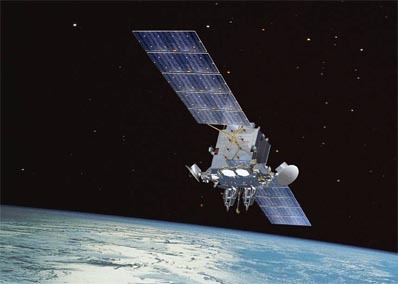 In the case of the Defense Department's AEHF program, the first satellite in that series launched in 2010 lost the use of its main engine when some obstruction accidentally left in the plumbing went undetected during manufacturing. Once controllers tried to fire that engine in space, it could not generate thrust. Heroic efforts by engineers created an alternate scheme to rely on the craft's smaller thrusters and electric propulsion system to overcome the fault and eventually reach the planned orbit 14 months later. AEHF 2's fuel- and oxidizer-delivery lines were fully vetted before that craft was committed to flight, ensuring no repeat drama. Burning hydrazine and nitrogen tetroxide, the main engine produces about 100 pounds of thrust in space. The United Launch Alliance-made rocket carried the 7-ton payload aloft two weeks ago, casting it free for the solo journey higher. And then came the news Wednesday that the satellite's main engine, called the liquid apogee engine, had successfully performed as planned, firing three times to hoist the orbit's low point to 10,150 miles and reducing inclination to just 6.9 degrees relative to the equator. "This success marks the completion of approximately 60 percent of AEHF 2's total orbit raising activity. Another reason this phase of orbit raising is so important is because it raised the satellite above the Van Allen radiation belts and region of space with the densest space debris," said Col. Michael Sarchet, the AEHF program manager. Also accomplished this week was the unfurling of the craft's power-generating solar wings to stretch 89 feet tip-to-tip. Next is the longer electric propulsion phase, lasting about 90 days, to finish shaping the orbit into a circular geosynchronous perch 22,300 miles high and tilted 4.8 degrees to either side of the equator. The Hall Current Thrusters, fed with xenon, fire nearly continuously for vast stretches of time to harness their whisper-like 0.06-pound thrust to propel the satellite to its proper altitude. AEHF was envisioned to keep communications flowing between the military and civilian leadership in a nuclear war for U.S. information superiority. Designers say one AEHF spacecraft has more capacity than the earlier five-satellite Milstar constellation combined and its high data rates will benefit tactical military communications, enabling higher quality maps, targeting data and live video to be transmitted without being detected by the enemy. Advancements in the AEHF spacecraft will offer faster connectivity to a greater number of warfighters for assured and protected communications. Read more about the AEHF system in our launch story.